5.0 megapixels HD CMOS sensor, Realize 5.0M HD real time Output. 5.4-97mm megapixels HD Electric zoom lens, 18X optical zoom. 14 PCS IR-III Dot Infrared Lights.Indoor IR distance can reach up to 120-180M. PTZ Function, Pan:360° continuous; Tilt:93°; can remotely control the direction of monitoring, and the scope of monitoring is wider and the control is more flexible. IE,CMS and intelligent mobile APP(Iphone IOS, Android system) for remoter monitoring, PTZ controlling, parameter setting and recording playback. 7' Metal shell shape with beautiful appearance,Humanized structure design, easy to adjust and install; Inside threading bracket, no risk of shearing. 14 PCS IR-III Dot Infrared Lights.Indoor IR distance can reach up to 120-180M; Design with intelligent light-activated and automatically detecting technology to control the infrared lights, reducing working hours of the light and extending product life in an energy-saving and environment-friendly way. 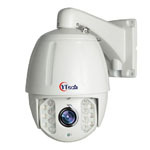 With external IR LED,lens is separate with IR,totally solve flash,reflecting and whitening etc. problems. PTZ Function, Pan:360° continuous,0-45°/s;Tilt:93°,0-30°/s;220 Preset positions,3 groups cruising scan( each group 16 preset,dwell time and speed selectable);Support 360° Scan, AB Scan(0-220 degree,1-9 grade selectable),positions Scan; can remotely control the direction of monitoring, and the scope of monitoring is wider and the control is more flexible. Support ONVIF2.0 standard, Compatible with Dahua and Hikvision. Local data can be stored in specific format, it can't be read directly or distort to ensure the data safety. Support power-off protection and auto resume. Continous/schedule/motion detection/alarm multi recording modes, six-speed motion detection sensitivity settings. Support quick or slow multi playback modes. Support motion detection, video shield/lost, alarm output/input, exception handling and other event- handling methods. The videos or snapshots can be stored by email whenever the camera detects motion. Built-in web sever, the remote real time operation such as recording, preview, video search, playback, PTZ Controling, parameter configuration can be realized by IE or CMS system, and support client (maximum up to 30)remote view simultaneously. With OSD menus in 20 languages, including English, Chinese, Traditional Chinese, Italian, Spanish, Japanese, Russian, French, German, Portuguese, Turkish, Polish, Romanian, Hungarian, Finnish, Thai, Greek, Portuguese (Brazil), Hebrew and Arabic, etc. The language SDK can be customized, more language supported. Multi-level access control, the visiting and opration by other can be set independently. Support IE,CMS and intelligent mobile APP(Iphone IOS, Android system) for remoter monitoring, PTZ Controling, parameter setting and recording playback. Support 3322 (Greek network), dyndns, oray (peanut shells), myq-see dynamic domain name service and so on. Powerful network services (TCP/IP, PPPOE, NTP, Email, P2P etc), make easy to communicate. Adopting the newest 5.0 megapxiels AR0521 HD CMOS sensor which presented by ON Semiconductor, and the High-performance processor Hi3516D DSP which purely compressed by hardware. In the image quality will not be affected premise,the monitoring objects can be zoom in or out by adjusting the optical magnification,more surveillance place can be adapted as it can be adjusted easily according to the the different environment. 18X optical electric zoom lens, remote control through client and APP. 5.0M pixles resolution, it can provide brightness and colorful video, which can compatible with CCD effect.